Price never moves in a straight line. 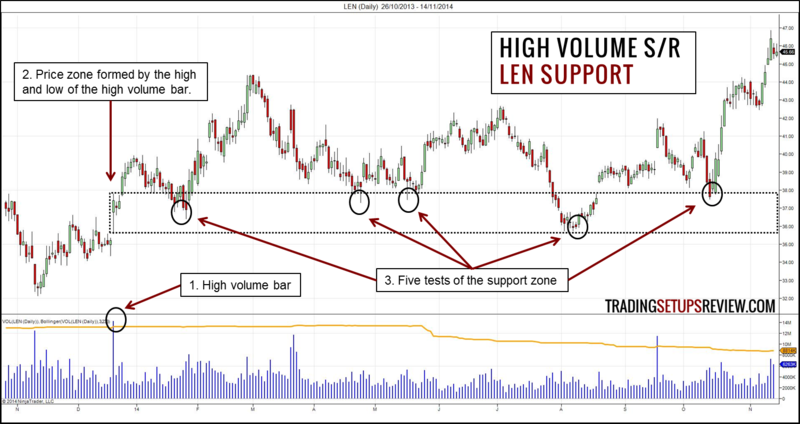 Price action bounces up and down between support and resistance levels. In fact, when skilled price action traders analyse a chart, they are just looking for support and resistance zones. We look at major support and resistance for market bias. We also make use of minor support and resistance for timing purposes. Support and resistance is a key price action trading concept. Hence, it is not surprising to find a myriad of techniques for projecting support and resistance. Traders seem to buy in areas of support and sell in areas of resistance. But they do not react to support and resistance because of magic. They do because they are interested in those price levels. The best way to gauge market interest is by observing volume. When a price zone gets the interest of the market, the market trades. Volume surges. Hence, by paying attention to volume clues, we can find reliable support and resistance areas. The easiest way to find volume-based support and resistance is to focus on climatic volume signals. While they do not occur often, you cannot miss them when they do. What are climatic volume signals? How high is high? Here, I will use the volume benchmark that I applied to find Anchor Bars and Exhaustion Gaps. The benchmark is the upper Bollinger Band with a look-back setting of 233 and a displacement of 3 standard deviations. If a price bar shows volume higher than this benchmark, we will zoom in and analyse it as a potential support or resistance area. First, find a high volume price bar, Then, mark its high and low prices. The area between is the potential support or resistance area. Let’s take a look at the two examples below. The top panel shows the daily price bars of SPY. The lower panel shows the volume of each day. The orange line is the Bollinger Band benchmark as described above. Look out for instances when the volume rises above the orange line. These two consecutive high volume bars caught our attention. Using the highest and lowest traded price of these two days, we drew a price zone. As the market rose, the price zone became a potential support zone. At the end of the first deep pullback down, the price zone offered perfect support to halt the market descent. This is a textbook example. Buying when the market dipped into the support zone was a great trade with almost no adverse movement. The next example will show that price action around a support zone is not always as neat. This chart shows the daily price bars of Lennar Corporation (LEN on NYSE). We spotted this clear surge in volume. Using the high and low of the high volume bar, we marked out a potential support/resistance zone. 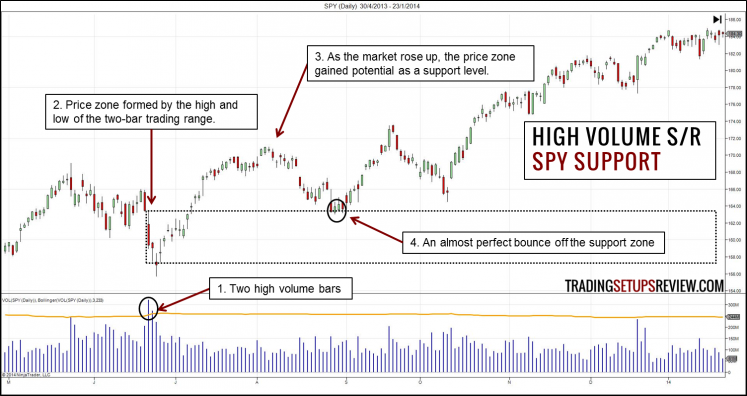 After rising above the price zone, the market tested the support zone for five times before leaving it alone. The fourth test was the strongest and shook most weak bulls out of their positions. The tests of the support zone were of varying strengths. Such market movement made it difficult to make use of the support zone for trade entries. Thus, blindly buying a bounce off the support zone was not ideal. It was essential to use more specific trading setups to define our risk and reward. When trading with any form of support/resistance, always look out for support/resistance zones that have failed. Generally, if the market falls sharply through a support area, it becomes invalid as a support. (You can still observe it for flip trades as the support switches into a potential resistance zone.) The same logic applies for a market rising through a resistance area with clear momentum. A tip for day traders: fine tune your support and resistance levels with range bars instead of time-based charts. Range bars with high volume are effective intraday support and resistance levels. High volume price zones are potential support and resistance areas. Potential is the key word here. They do not always work. Hence, you must not trade them blindly. While looking out for high volume price zones is great for mapping the market structure, it is not a complete trading method. You should always use other trading methods to time your entry. Suffering from whipsaws and uncontrolled risk? Learn to time your trades with a simple and effective price pattern. Good article but not sure how I can get the Bollinger Bands in the same panel as the volume. Presumably this would depend on the package but it looks like you’re using Ninjatrader – could you explain how you can accomplish this please? For NinjaTrader, under the indicator settings > Visual > Panel, you can select which panel you want that indicator to be plotted in. In the examples here, I selected the second panel. Hope this helps! Thank you Galen for sharing this. I read somewhere that the high and low of the first 1 minute bar of the day serves as a good S/R point fyi. I just wanted to know, what happens after the discovery of a new qualifying volume bar, do you disregard all the older levels and use the latest ? You should certainly give the most weight to the latest qualifying volume bar. But you should not ignore the past few qualifying bars completely. It depends how back did they occur, and if they are overlapping. (I think very often the first one minute bar of the day will meet the criteria of a qualifying bar in the article so that observation is consistent with this approach.) Thank you! On TradingView, first, make sure that you have Volume loaded. Then, load Bollinger Bands normally and go to its “Inputs” >> “Source” and choose “Vol:Volume”. That will do it. Remember to change the Bollinger Bands settings too. please, how I can applied the Bollinger Bands with customizable standard deviation to the volumes panel of MT4? And where can I find the indicator (or a similar one) able to do this in MT4? Many thanks and a lot of congratulations for your excellent website! Hi Massimo, thank you for your kind words! I couldn’t find an easy way to apply Bollinger Bands on volume in MT4. Perhaps other readers who are more familiar with MT4 can help you out. so, I extend my questions to all the readers: is there anybody who can help me find a solution (or indicator) able to apply Bollinger Bands on volumes in MT4?